The heritage precinct is both, a tree spangled island and the last bastion of a threatened community. To its residents, the BMC’s move to fill its streets with hawkers has become a metaphor of loss. Jimmy Gymkhanawalla is flexing his muscles. Homi Homeopath looks like an overdose of Nux Vomica. Soli Solicitor is preparing a brief which is anything but. 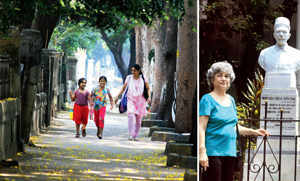 Dadar Parsi Colony has never been so agitated – and certainly never so united – in living memory. Mani Manor, Villoo Villa and Tehmi Terrace have been shaken to their foundations. While nibbling eclairs at Cafe 792, buying Bombay duck at the Katrak Road bazaar, flirting on the Five Gardens railings, waxing legs and getting the soft areas treated with an epilator at Cinderella salon, practising a Shiamak sizzler, swotting for the CA exam, or even lighting a divo at the Rustom Framna Agiary, there’s only one demand: Save Us From Death By Hawkers. The Damocles sword is the Street Vendors Act 2014, passed on the double-edged premise of “livelihood”. Some 1,800 hawkers have been “allotted” space across Dadar Parsi Colony, Hindu Colony and Matunga. Signature campaigns have been launched, the media co-opted, authorities appealed to. The municipal corporation has thrown up its helpless hands, saying that only the Supreme Court can decide on the matter. It would indeed be a landmark case, calling for a great leap out of the box. Today, residents and “well-wishers” will march in protest from the police chowky to the statue of the Dadar Parsi Colony’s founder, Muncherji Joshi. The foresight of this Bombay Improvement Trust civil engineer created a residential haven for Parsis in 1920, far from their traditional concentration in congested, plague-ridden “Fort”. Joshi is remembered gratefully by their descendants who live in the spacious, airy, three-storied houses cosseted by a benign and profuse botanica: not just the spreading rain trees or the banyan – “wad” which gave Wadala its name, but also rare ebony and mahogany.